Corsair has expanded its Corsair ONE line of mini-PCs, aiming for the higher end of the market. The Corsair One Pro i180 is equipped with Intel’s 12-core high-end desktop processor as well as NVIDIA’s GeForce RTX 2080 Ti graphics card, which is why the manufacturer calls it a compact workstation. In addition, the company has also introduced new variants under the Corsair One i140 and Corsair One i160 naming system. Corsair launched its first own-brand Corsair One systems in early 2017. The concept of the system was to take advantage of the company’s know-how: Corsair knows how to build cases with good ventilation, it produces SFF PSUs, it produces custom liquid cooling, and other components. 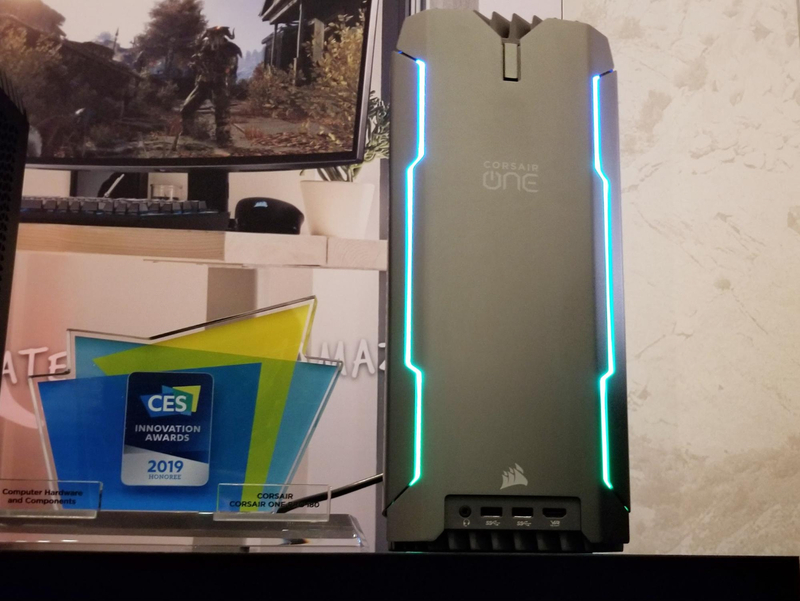 With the Corsair ONE, the company managed to create a Mini-ITX platform capable of handling high-performance components. This year at CES, the system is getting a refresh and expanding into several different variants. The dark grey Corsair One Pro i180 is based on ASRock’s X299E-ITX/ac motherboard, Intel’s 12-core Core i9-9920X processor and NVIDIA’s GeForce RTX 2080 Ti graphics card. The CPU and the GPU are cooled using separate AIO implementations, dissipating a total of ~400 W of thermal power, which is a notable achievement as we are talking about a 12-liter PC. 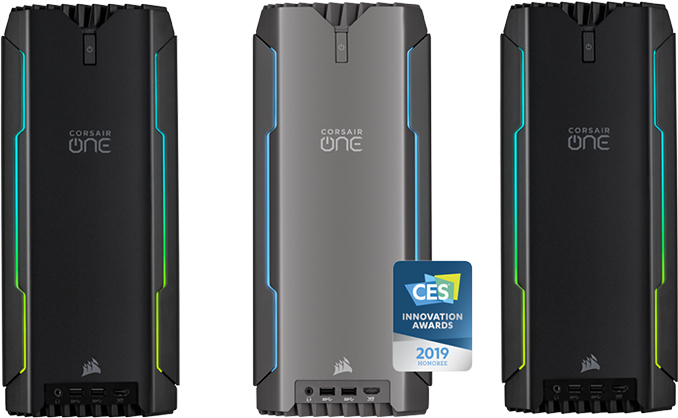 Being aimed at prosumers, the Corsair One Pro i180 comes equipped with 32 GB of quad-channel DDR4-2667 memory, a 960 GB M.2 PCIe/NVMe SSD, and a 2 TB 2.5-inch HDD. As for connectivity, the compact PC features everything that the X299E-ITX/ac motherboard and NVIDIA’s GeForce RTX 2080 Ti have, including Intel’s Wireless-AC 8265 802.11ac + Bluetooth 4.2 controller, two GbE ports (driven by Intel’s I219-V and I211-AT), six USB 3.0 Type-A connectors, one USB 3.1 Gen 2 Type-C port, one USB 3.1 Gen 2 Type-C receptacle, a TRRS audio jack, and four display outputs (three DisplayPort 1.4 and one HDMI 2.0b). It is important to note that due to customer feedback, the front panel for this version of the Corsair One has been moved to the bottom, rather than staying at the top. Along with its top-of-the-line Corsair One Pro i180, the manufacturer also released its Corsair One i140 and Corsair One i160 systems. The One i140 is powered by Intel’s eight-core Core i7-9700K processor accompanied by NVIDIA’s GeForce RTX 2080, whereas the One i160 is based on Intel’s eight-core Core i9-9900K CPU paired with NVIDIA’s GeForce RTX 2080 Ti. Both PCs come with 32 GB of dual-channel DDR4-2667 memory, a 480 GB PCIe/NVMe, a 2 TB HDD, and I/O capabilities similar to those of the high-end HEDT machine. Following the latest trends, all the new Corsair One PCs are equipped with programmable RGB LED bars to make them look attractive in the eyes of modern gamers. Now, time to talk about prices of the latest Corsair One PCs. The top-of-the-range Corsair One Pro i180 is going to cost a rather whopping $5,000 when it becomes available later this year. The “cheaper” Corsair One i140 and Corsair One i160 systems will be priced at $3,000 and $3,600 (respectively) when the manufacturer releases them in February. 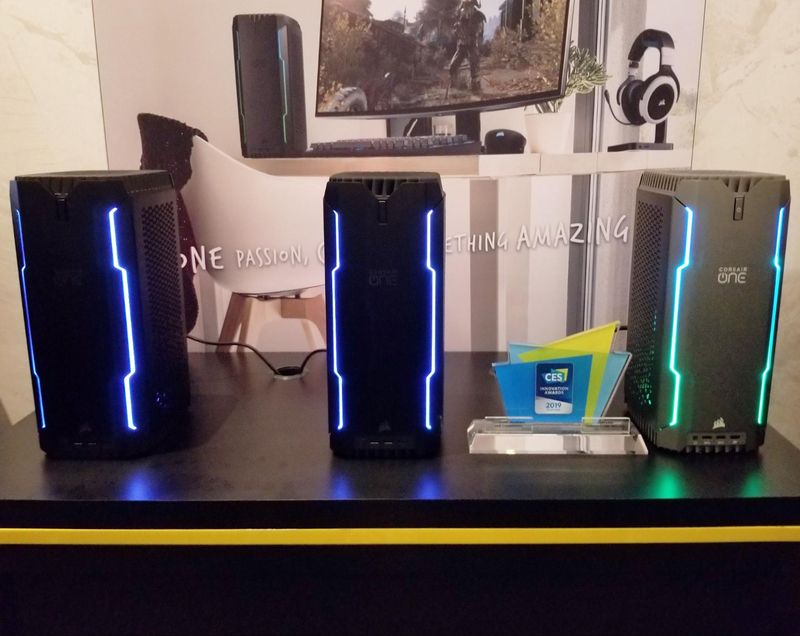 It is noteworthy that while Corsair’s first-gen One systems used to be priced in the range between $1,800 and $2,400, the new-gen One PCs will retail for $3,000 – $5,000, essentially competing against various ultra-high-end custom-built PCs and brands.